I spent 4 summers on Catalina Island culturing planktic foraminifers. During my first field season, my goal was simple: collect deep dwelling planktic foraminifers using a plankton net and get them to survive, grow, and complete their life cycle in the laboratory. We had great success getting the deep dwellers N. dutertrei and N. pachyderma to grow in culture during our first culture season in 2011 despite the fact that the culture conditions were designed for warmer, shallower species. After that first season, I was funded (with co-PIs Ann Russell and Tessa Hill) to continue lab culture projects of the deeper dwelling species, concentrating our efforts at both the Catalina Island and at the UC Davis Bodega Marine Laboratory. We also investigated controls on trace element variability in both spinose and non-spinose species (e.g. what controls Mg/Ca banding and other sub-micron scale heterogeneity). Below are some images of the deep dwellers captured in 2011. Additional pictures from the summer of 2014 and 2015 are posted in my blog. Our goals with culturing the deeper dwelling foraminifera are to calibrate their geochemistry with temperature, pH, and salinity and improve our understanding of their ecology and ontogeny using plankton tow data, CTD data, and observations of the foraminifera while in culture. We have VASTLY improved our culturing techniques and have gone from 50-90% post-collection mortality to nearly ZERO! Want to know more about the culturing work? Check out the great short documentaries posted below. These documentaries were filmed by Dan Brinkhaus of ScienceMedia.nl. The first video discusses WHY scientists, like me, want to culture planktic foraminifera. The second documentary discusses the foram culturing process. N. pachyderma has bright red or orange cytoplasm. 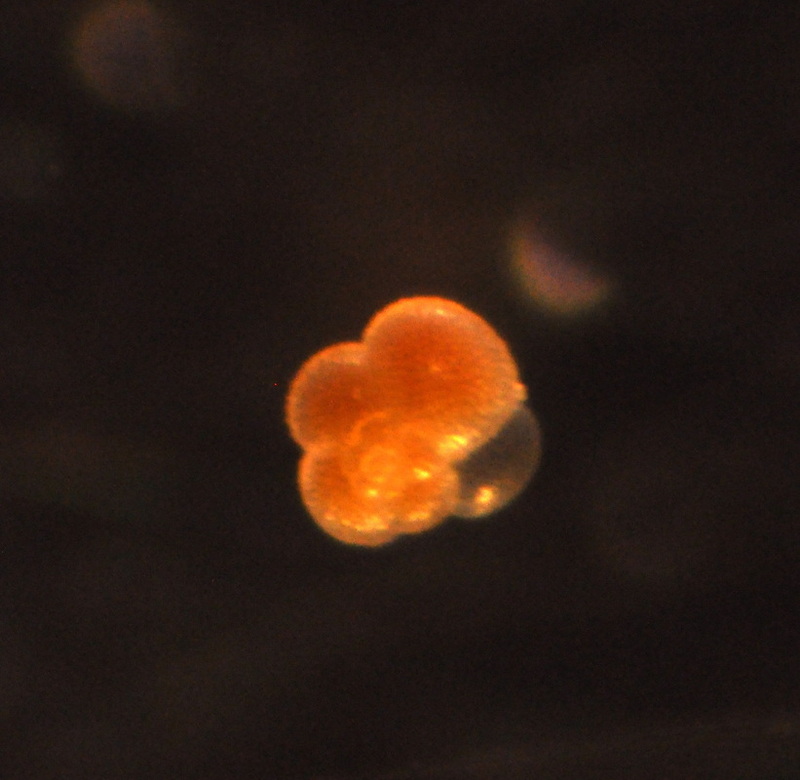 The cytoplasm turns white if the foram is left under bright light. When they are left in the dark (no light) the cytoplasm gets darker. Notice the thinly calcified newchamber, devoid of cytoplasm. 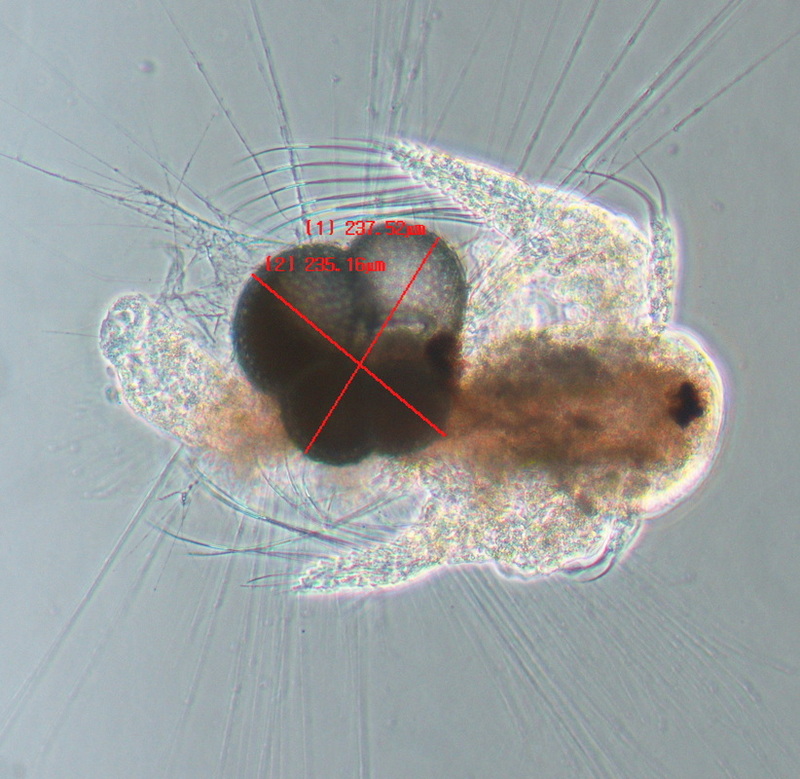 This N. dutertrei was fed a single frozen (thawed) 1-day old artemia brine shrimp. Click on the image for a larger version where you can see the new chamber (no cytoplasm in it yet) and the rhizopodia. 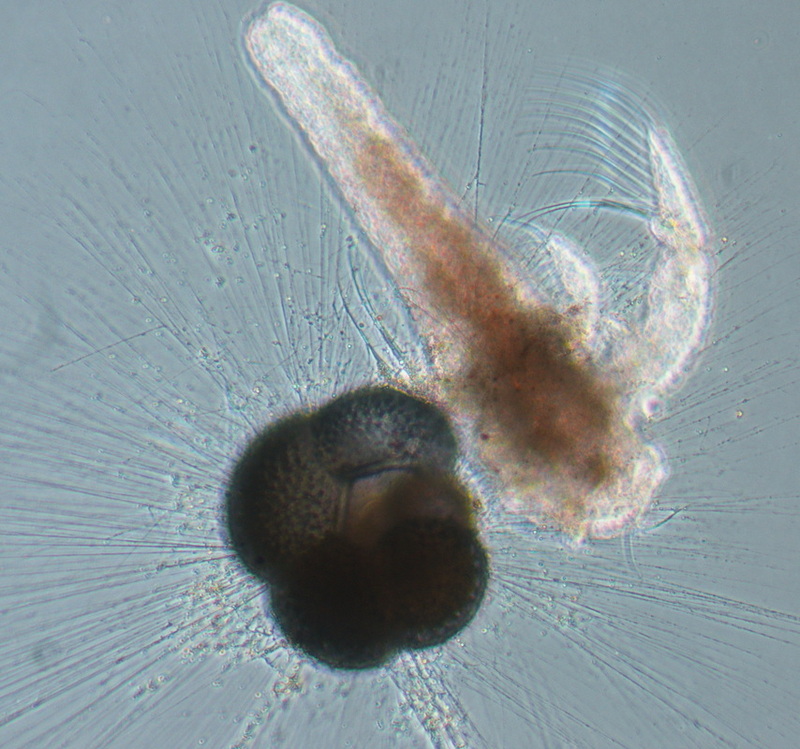 This smaller N. dutertrei was also fed a single frozen (thawed) 1-day old artemia brine shrimp. The shrimp has lost shape because it's being digested by the foram. Click on the image for a larger version where you can see the new chamber (no cytoplasm in it yet) and the rhizopodia.